Posted in: Corporate Fascism, Kleptocracy. Tagged: 9/11, al qaeda, al qaida, anonymous, china, cyberespionage, cyberterrorism, false flag, fascism, fascists, fbi, fearmongering, hackers, hacktivists, idf, lulz security, military industrial complex, ndaa 2012, occupy wall street, ows, terrorism, terrorism industrial complex, top secret america, vvv pr, world war web. “Anonymous” may once have been a homogenous band of high-minded hacktivist heroes working selflessly for the greater good. But sadly, that ship has sailed. 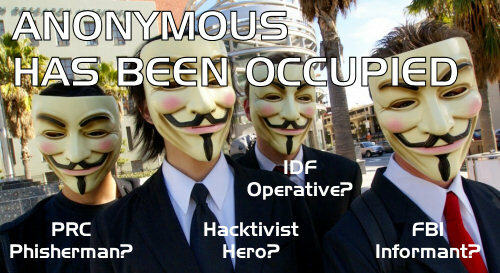 “Anonymous” has been occupied. And no longer just by web warriors laying waste to websites of the wicked, computer wizards worming their way into the iPhones of “Internet Security” frauds, or digital do-gooders doxing Congressional dolts and other corporate-controlled degenerates. Also sobering is the ease with which sovereign governments, corporate conglomerates and the global elite who control them can now conduct false flag cyber-ops to advance their agendas and blame them on the brave band of brothers and sisters behind all those virtual Fawkesian masks. Consider, for example: When the FBI penetrated Lulz Security, was their aim merely to probe the hackers, or to impact their agenda? Were all of the federal websites hit in recent weeks hacked by democracy-minded dissidents, or were some of them targeted by Shangdong saboteurs from one of China’s six TRBs (technical reconnaissance bureaus)? And what was the Israeli Defense Force (IDF) recruiting hackers for, if not to hack? This document may contain links shortened using http://tinyurl.com to facilitate emailing. If you are concerned we might use them to cloak phishing or malware, we recommend you open them with this: http://longurl.org. Also our thanks to the web designs mobile, web designers mobile and web developers mobile that support our efforts. In Post-NDAA Amerika, What is a Terrorist and Who Can Make You Disappear by Calling You One? Posted in: Corporate Fascism, Kleptocracy. Tagged: aumf, big brother, domestic terrorism, fascism, fascist, fascists, international terrorism, national defense authorization act, ndaa, ndaa 2012, occupy wall street, ows, suspected terrorist, suspicious activity, suspicious activity reports, terrorism, terrorist, terrorists, vvv pr. IN POST NDAA AMERIKA, WHAT IS A TERRORIST AND WHO CAN MAKE YOU DISAPPEAR BY CALLING YOU ONE? 1. What is the legal definition of “terrorist”? 2. Who can make you disappear by calling you one? (VI) to commit an act that the actor knows, or reasonably should know, affords material support, including a safe house, transportation, communications, funds, transfer of funds or other material financial benefit, false documentation or identification, weapons (including chemical, biological, or radiological weapons), explosives, or training – (aa) for the commission of a terrorist activity; (bb) to any individual who the actor knows, or reasonably should know, has committed or plans to commit a terrorist activity; (cc) to a terrorist organization described in subclause (I) or (II) of clause (vi) or to any member of such an organization; or (dd) to a terrorist organization described in clause (vi)(III), or to any member of such an organization, unless the actor can demonstrate by clear and convincing evidence that the actor did not know, and should not reasonably have known, that the organization was a terrorist organization. (v) “Representative” defined As used in this paragraph, the term “representative” includes an officer, official, or spokesman of an organization, and any person who directs, counsels, commands, or induces an organization or its members to engage in terrorist activity. (vi) “Terrorist organization” defined As used in this section, the term “terrorist organization” means an organization – (I) designated under section 1189 of this title; (II) otherwise designated, upon publication in the Federal Register, by the Secretary of State in consultation with or upon the request of the Attorney General or the Secretary of Homeland Security, as a terrorist organization, after finding that the organization engages in the activities described in subclauses (I) through (VI) of clause (iv); or (III) that is a group of two or more individuals, whether organized or not, which engages in, or has a subgroup which engages in, the activities described in subclauses (I) through (VI) of clause (iv). As used in this chapter- (1) the term “international terrorism” means activities that- (A) involve violent acts or acts dangerous to human life that are a violation of the criminal laws of the United States or of any State, or that would be a criminal violation if committed within the jurisdiction of the United States or of any State; (B) appear to be intended- (i) to intimidate or coerce a civilian population; (ii) to influence the policy of a government by intimidation or coercion; or (iii) to affect the conduct of a government by mass destruction, assassination, or kidnapping; and (C) occur primarily outside the territorial jurisdiction of the United States, or transcend national boundaries in terms of the means by which they are accomplished, the persons they appear intended to intimidate or coerce, or the locale in which their perpetrators operate or seek asylum; (2) the term “national of the United States” has the meaning given such term in section 101(a)(22) of the Immigration and Nationality Act; (3) the term “person” means any individual or entity capable of holding a legal or beneficial interest in property; (4) the term “act of war” means any act occurring in the course of- (A) declared war; (B) armed conflict, whether or not war has been declared, between two or more nations; or (C) armed conflict between military forces of any origin; and (5) the term “domestic terrorism” means activities that- (A) involve acts dangerous to human life that are a violation of the criminal laws of the United States or of any State; (B) appear to be intended- (i) to intimidate or coerce a civilian population; (ii) to influence the policy of a government by intimidation or coercion; or (iii) to affect the conduct of a government by mass destruction, assassination, or kidnapping; and (C) occur primarily within the territorial jurisdiction of the United States. (d) Definitions As used in this section- (1) the term “international terrorism” means terrorism involving citizens or the territory of more than 1 country; (2) the term “terrorism” means premeditated, politically motivated violence perpetrated against noncombatant targets by subnational groups or clandestine agents; (3) the term “terrorist group” means any group practicing, or which has significant subgroups which practice, international terrorism; (4) the terms “territory” and “territory of the country” mean the land, waters, and airspace of the country; and (5) the terms “terrorist sanctuary” and “sanctuary” mean an area in the territory of the country- (A) that is used by a terrorist or terrorist organization- (i) to carry out terrorist activities, including training, fundraising, financing, and recruitment; or (ii) as a transit point; and (B) the government of which expressly consents to, or with knowledge, allows, tolerates, or disregards such use of its territory and is not subject to a determination under- (i) section 2405(j)(1)(A) of the Appendix to title 50; (ii) section 2371 (a) of this title; or (iii) section 2780 (d) of this title. Now on to the second question: Who can make you disappear by calling you one? According to the Washington Post’s TOP SECRET AMERICA project, there are “45 government organizations (for example, the FBI) engaged in top-secret work [that can] be broken down into 1,271 sub-units (for example, the Terrorist Screening Center of the FBI).” I’m pretty sure they can. But they also mention “4,058 government organizations involved in domestic counterterrorism and homeland security” including 2,880 federal organizations that work at the state level, such as the FBI’s Joint Terrorism Task Forces (JTTFs), plus 818 state and 360 local organizations. I’m pretty sure they can, too. And then of course there’s the “1,931 companies engaged in top-secret work for the government.” I’d wager some or all of them can, as well. We sometimes use links shortened with http://tinyurl.com to so they don’t break in emails. If you actually think we would use them to cloak phishing or malware, open them with this: http://longurl.org. We also want to thank the website design miami, website designer miami and website developer miami who support our efforts.